The Capillarity Apparatus is intriguing demonstration of molecular attraction. 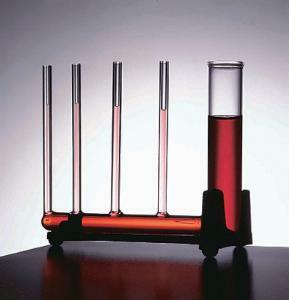 Adding colored water to the reservoir tubes of the apparatus shows how water ascends into spaces by capillary action. The water levels will vary in the four differently-sized glass tubes, rising above the reservoir level in the narrower tubes. The glass unit is firmly supported in a metal base and measures 5½ x 4¾".